The Special Town Meeting Warrant article that would limit the ability of our firefighters to determine their own working conditions is bad management, ill conceived policy and inappropriate for a town meeting vote. The article reads: "No employee of the Town shall be regularly scheduled to work for the Town more than 14 continuous hours in any midnight to midnight 24 hour period." There will be a public forum on October 7th at 7:00pm to discuss the proposed charter amendment. The Special Town Meeting to pass the article is scheduled for October 27th. Working conditions, including shifts and hours, are part of the collective bargaining process and involve administrative and professional technical issues that the general public is ill equip to judge appropriately. The proposed article not only interferes with the administration of the fire service, it would also apply to all town employees regardless of department, position, or activity, making it a prime example of a “one size fits all” policy that will certainly set a bad precedent and very likely produce serious unintended consequences. Our town employs a wide variety of professionals, who operate with distinct professional standards and methods. One size will not fit all. Why has this article been proposed? Twenty-four hour shifts are common in our area and around the country. There is no evidence that such shifts lead to reductions in public safety, fire service efficiency or effectiveness. Nor have such shifts increased public safety expenditures to communities. Indeed, cost savings have been achieved. Concerns over sleep-deprived fire fighters on 24-hour shifts are unwarranted. In fact, 24-hour shifts reduce the likelihood of tired firefighters. Presently, most fire fighters need a second job and are more likely to go directly from their 2nd job to their fire department 10-14 hour shift. Twenty-four hour shifts allow for more reasonable scheduling of 2nd jobs and increased on-duty rest opportunities for fire fighters. By accommodating the difficult schedules of our fire fighters, we help maintain high morale and signal our respect for their time, sacrifice, and professionalism. Allowing the general public to dictate working conditions sends these dedicated public service professionals a very different message, especially if it makes it harder for them to make ends meet. A final criticism without foundation is the concern over changes to personnel operations such as the administration of sick leave and vacation time. Since several local communities have these shifts, we simply need to ask our neighbors if there have been any problems related to personnel administration. According to a member of the Chicopee Fire Department with whom I spoke, there are no such problems. In fact, the 24-hour shifts have saved Chicopee money in emergency overtime, which is required every time a call overlaps with a shift change, something far less frequent when there is only one shift change per day. This proposed charter amendment is an insult to our hard working public safety professionals who deserve our support and have surely earned our respect. I encourage my fellow Longmeadow residents to vote against this ill-conceived and unwarranted interference with the administration of the Fire Department, as well as the rest of our town’s agencies. It is bad management, bad policy, and bad politics. The Longmeadow School Building Committee will be meeting on Wednesday, September 30 (6 PM, LHS cafeteria) to decide which school building option to move forward for approval by the Massachusetts School Building Authority (MSBA). This is an important decision because it sets the path forward ending with a town meeting vote in April 2010 and a town election vote in June 2010. At the last public forum on September 16 seven different options ranging from renovation to all new construction were presented to a group of ~ 150 town residents. The presentation revealed that there has been a great amount of effort thoughtfully expended with a number of interesting options identified. The one that seemed to be the frontrunner in the discussion was called Option 2B. 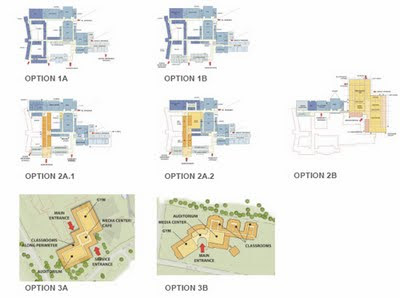 This option involved renovation of the 1971 section of the building (to preserve the pool and building wing in best condition), demolition of the remaining sections and the building a new addition of 190,000 sq ft for classroom and primary core spaces (see figure below). Other than qualitative commentary, one important piece of information was missing from all of the options presented was cost. 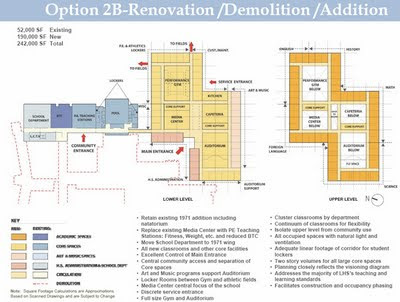 From what was presented, it appears likely that option 2B may be the most expensive choice since it will involve construction of 190,000 sq ft of new facility that is not considered “model school”. Options 3A and 3B will likely not be far behind. If the new Wilbraham-Hampden Regional HS cost is any indication, we should expect a pricetag of option 2B to be in the neighborhood of $70-80 million. It would have been of considerable value to have an estimated cost for each of the 6 options presented at this public forum. For a copy of the full presentation or to view the forum video, visit the SBC website. At the SBC meeting on September 30 cost information for the six options will become available and used to make the final choice. According to Bob Barkett, co-chair this information will be presented at the beginning of the meeting. Longmeadow is getting a chance to do something about its deteriorating high school facility and have the state of Massachusetts provide a large amount of the required funding. The SBC needs to make the choice that has the best probability of being accepted by the residents of Longmeadow. Because the state has ~ 160 other school building projects in the pipeline, it will be a long time before we will get another chance. I wish the SBC much wisdom and good judgement with the decision that they make on Wednesday night.